The condition of a gas tank needs to be supervised. If a gas leak is detected, an alarm has to be activated and a text mail be sent by SMS or email to the responsible person on standby duty in order to avoid damage caused by the escaping gas. For this gas tank supervision task the intelligent Ethernet systems MSX-E3011 and MSX-E1516 are used in combination with an UMTS/GSM router. The MSX-E systems are the ideal solution, as they are compact, portable and can work in stand-alone mode. 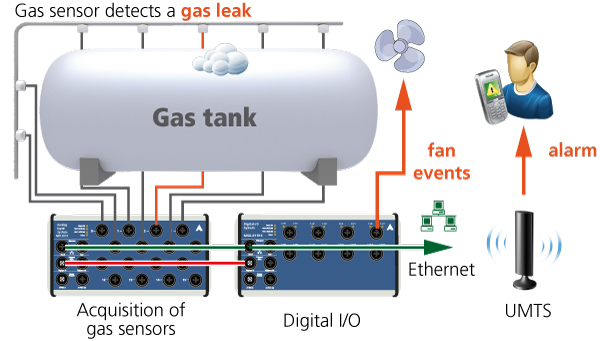 The MSX-E3011 continuously acquires gas sensor inputs from the surface of the tank. If there is a gas leak and the predefined gas values are exceeded, an alarm is activated by the system and a text message is sent via UMTS/GSM. For normal control tasks like regulating the on- and off switching of the valves, the MSX-E1516 has been chosen. All the measured values are saved in a ring buffer and deleted after some time, when they are not needed anymore. The application can be monitored remotely.